NEW & EXCLUSIVE to Israel-Catalog! 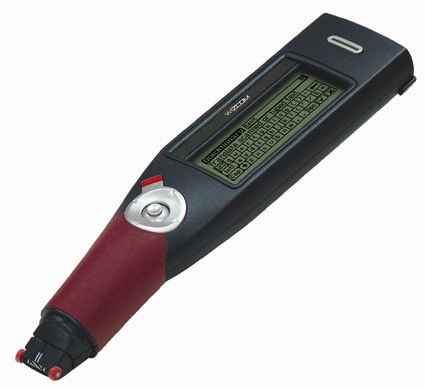 World wide premier of hand held OCR pen that scans and simultaneously translates Hebrew words & phrases into English. Also scans English to Hebrew / Russian / Arabic / French. Scan and Translate written Hebrew text to English instantly! Scan and translate single words or full lines of text in seconds (navigate through the sentence to select words for translation). See the scanned text and its translations together on a split screen display. The user friendly touchscreen shows the scanned text and its translation simultaneously, it's the ultimate tool for those who wish to learn Hebrew. Use the Virtual keyboard and stylus pen to type in any word to see or hear its translation immediately. Hear the entire line of scanned text, or a selected word, spoken by the built in Text to Speech Technology. In addition to the exclusive Hebrew to English translation, this Quicktionary pen will also translate from English to Hebrew, Arabic, Russian and French instantly.+This exclusive version translates from Hebrew to English with a large built in Hebrew dictionary of words, popular expressions and local idioms, expressly designed with the Israeli tourist in mind! Translation that is more comprehensive than just the most frequently used meaning of the word. Identification & display of inflected words with their corresponding entries. 300,000 words and expressions recognized per dictionary. Last 80 reviewed words saved in History option for easy retrieval. Audio word pronunciation with Text-to-Speech (TTS) technology using built-in speaker or with earphones (available in most products). Two available display modes: Switch between abridged and complete definition/translation display. Displays up to 5 lines of text on a high resolution touch-screen. Interactive games for practicing and enhancing vocabulary using reviewed words list (History) or entire dictionary list (not available in all products). Quick and easy navigation using the included stylus. Audio Built-in speaker, earphone socket (available with most versions).